In the premier episode (shooting begins in the next few weeks), the Man Cave Crew will be converting a garage into a poker room, allowing it to fully function as a dual purpose room. 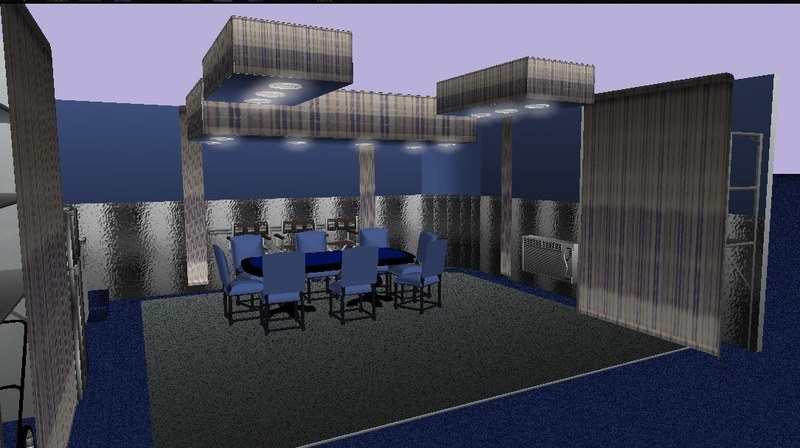 The curtains will serve to mask storage areas and provide decorative accents to the poker garage design, as shown in the CAD rendering of the poker garage design presented below. We look forward to seeing this Man Cave garage build out come to fruition. Episode 2 will feature the upgrade of a basement home theater. A blackout curtain will be utilized to help control ambient light and add to the ambiance of the home theater. We will share more information as it becomes available. We are excited about this new relationship as it will help to demonstrate the flexibility that track mounted curtains offer homeowners as the look to better utilize space in their home. For more info on The Man Cave Crew, visit their Facebook page where they provide updates to their fans, including the recent introduction of show co-host Alyssa Johnson. We will let you know when and where you will be able to watch the premier of this new home improvement show created specifically for guys and scheduled to air on Comcast SportsNet Chicago (CSN), which is available via Comcast cable service in the mid west and nationwide via satellite (DIRECTV, DISH, and others). Stay tuned, and Cave on!